All doors and the liftgate can be locked/ unlocked by pressing the request switch on the front doors while the key is being carried. 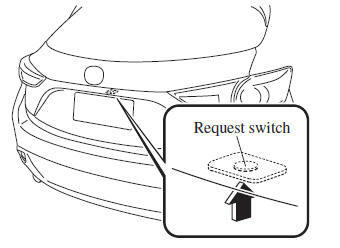 The request switch on the liftgate can only be used to lock all doors and the liftgate. To lock the doors and the liftgate, press the request switch and the hazard warning lights will flash once. A beep sound will be heard once. To unlock the driver's door, press the request switch. A beep sound will be heard twice and the hazard warning lights will flash twice. To unlock all doors and the liftgate, press the request switch again within 3 seconds and two more beep sounds will be heard. To unlock all doors and the liftgate, press the request switch. A beep sound will be heard twice and the hazard warning lights will flash twice. After this, the system switches the setting of pressing the driver's request switch once or twice to unlock all doors and the liftgate each time the UNLOCK button is pressed (the sound of the doors locking/unlocking can be heard). Confirm that all doors and the liftgate are securely locked. For the liftgate/trunk lid, move it without pressing the electric liftgate/ trunk lid opener to verify that the liftgate/trunk lid has not been left ajar. All doors and the liftgate cannot be locked when any door or the liftgate is open. It may require a few seconds for the doors to unlock after the request switch is pressed. 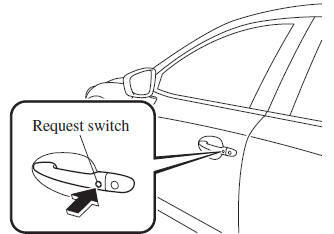 A beep sound is heard for confirmation when the doors and the liftgate are locked/unlocked using the request switch. If you prefer, the beep sound can be turned off. The volume of the beep sound can also be changed. Refer to Personalization Features on . The setting can be changed so that the doors and the liftgate are locked automatically without pressing the request switch. A beep sound is heard when all doors and the liftgate are closed while the advanced key is being carried. All doors and the liftgate are locked automatically after about three seconds when the advanced key is out of the operational range. Also, the hazard warning lights flash once. (Even if the driver is in the operational range, all doors and the liftgate are locked automatically after about 30 seconds.) If you are out of the operational range before the doors and the liftgate/trunk lid are completely closed or another key is left in the vehicle, the auto-lock function will not work. Always make sure that all doors and the liftgate/trunk lid are closed and locked before leaving the vehicle. The auto-lock function does not close the power windows. After unlocking with the request switch, all doors and the liftgate will automatically lock if any of the following operations are not performed within about 60 seconds. If your vehicle has a theft-deterrent system, the hazard warning lights will flash for confirmation. Opening a door or the liftgate/trunk lid. Switching the ignition to any position other than off.